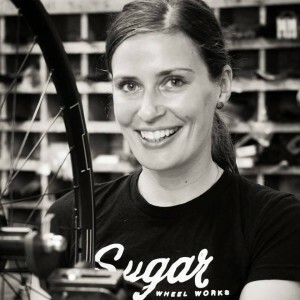 Jude Gerace is the proprietor of Sugar Wheel Works; we chat about what keeps us rolling, but first talk about bicycle storytelling event Live the Revolution, which she helped to start, and then cover wheel building and what she uses hers for. Also: Aaron is still looking for a house, and Brock went to Eugene for the weekend. Lumberjack (Brock’s band) playing The Old Gilbert Road Tavern March 4! Alex on twitter wonders about Aaron’s phone setup. Rob & Eric talk about Strava & GPS art! Wayne shares Liz Thomas’ PDX urban hike plans. Phil in AK has good things to say about South Dakota’s Badlands and running without a phone. Richard congratulates PDX on finally getting a bike share program.